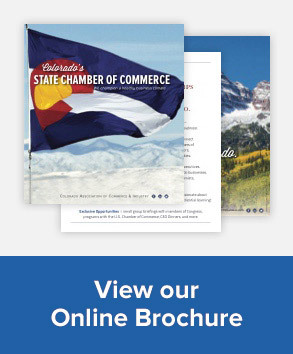 A primary role of the Colorado Chamber of Commerce is to protect and improve the state’s business climate and help elect pro-business legislators to the Colorado General Assembly. Every two years, the Chamber’s lobbying team and its Political Action Committee, interview new legislative candidates and vote to endorse those candidates. This cycle, forty-five (45) candidates participated in that interview process, and responded to various policy questions ranging from energy, health care, employment, agriculture and other areas. Over 60 companies and its representatives participated in the four-day process who represent a wide array of Colorado industries. In preparation for the interviews, the lobbying team prepares a highly detailed report on each legislative race that includes voter performance, party registration, candidates’ profile and up-to-date funds raised. A candidate questionnaire was also provided for each interview. The endorsement process includes recommendations of legislative incumbents who are evaluated on voting records for the prior two legislative sessions. “The candidate interview process is exhaustive and provides an opportunity for our members to acquaint themselves with those seeking election to the legislature. It is an effective way to determine which candidates are truly pro-business and will support the interests of the employers that fuel Colorado’s economy.” Loren Furman, Colorado Chamber of Commerce Senior Vice President of State & Federal Relations. For more information about the Chamber’s candidate-endorsement process, please contact Loren Furman, Senior Vice President, State and Federal Relations, at 303.866.9642. If there was ever a year in recent memory in which critical state elections will matter hugely to the statewide business community that the Colorado Chamber of Commerce (CACI) represents, it’s 2018. For the first time in eight years, a new governor will be elected. Total control of the legislature by the Democrats is a very real possibility if Senate Republicans lose one seat while Democrats retain control of the House. A multitude of referred amendments from the legislature and ballot initiatives to amend the Colorado Constitution could drastically affect the Colorado business climate in either good or bad ways. Two initiatives concerning transportation infrastructure funding, a third involving a tax increase for education and a fourth dealing with restriction of energy production top the list of the potential ballot measures that could profoundly affect Colorado businesses. The legislature has referred six proposed constitutional amendments to the ballot. One would change how Colorado conducts congressional redistricting (Amendment Y) and one would change legislative redistricting (Amendment Z). The deadline for submitting initiative petitions to the Colorado Secretary of State’s Office was Monday. The Office has until September 5th to check signatures and qualify initiatives for the November ballot. The signatures also can be challenged by opponents of an initiative. The normal policy of the Board of Directors of the Colorado Chamber is to wait until an initiative has qualified for the ballot before discussing whether to support, oppose or remain neutral on the measure. This is the first election under which new rules govern citizen initiatives to amend the Colorado Constitution. A successful ballot amendment, Amendment 71, called “Raise the Bar” in 2016 sought to make it more difficult for advocates to submit ballot measures. Ballot measures that would amend the Constitution also need a 55 percent voter approval, up from a majority vote. Following are the four most important submitted ballot measures for the business community; the Colorado Secretary of State’s Office announced yesterday that the first one, Initiative 93, has qualified for the ballot. Initiative 93, called Great Schools, Thriving Communities, is backed by, among others, the Colorado Education Association (CEA), a Chicago-based organization called Stand for Children and the Colorado Fiscal Institute, a liberal think tank. As of August 1st, the initiative’s campaign committee, “Great Schools Thriving Communities” (Secretary of State Office ID # 2018503370) had raised about $318,000. Initiative 93’s tax increase would hit damage Colorado’s business climate because it is aimed directly at businesses and high-income individuals. First, it would increase the corporate income-tax rate from the current 4.63% by an additional 1.37% for C-corporations, both domestic and foreign. That’s a 30% increase in the corporate income tax rate. Second, it would increase the current 4.63 percent personal income-tax rate (see below) by a four-step graduated increase for businesses filing via an individual’s social security number from an increase of 0.37% up to 3.62% maximum. In 2013, Colorado voters by a 64 percent to 35 percent margin resoundingly defeated Amendment 66, which would have increased taxes by almost $1 billion on individuals (including non-corporate businesses), estates and trusts to fund P-12 education.
. . . a business owner who operates as “sole proprietorship” or two or more business owners who operate as “general partnership,” “limited partnership,” “limited liability company (LLCs)” and “S Corporations” file their tax returns as individuals. The tax increase will directly hit the 95 percent of all Colorado businesses that pay taxes through the individual income tax code. These firms employ 57 percent of all Coloradans . . . The measure makes changes to the Colorado Constitution and state law related to funding for public education. Quality Public Education Fund. The measure creates the Quality Public Education Fund (fund) in the Colorado Constitution. Money in the fund is to be used to support and enhance the quality of preschool through twelfth grade (P-12) public education beginning in FY 2019-20. The fund will contain revenue from a proposed income tax increase, discussed below. Money in the fund is exempt from the TABOR revenue limit and must be used to supplement General Fund appropriations for P-12 public education as of the measure’s effective date, adjusted each year for inflation up to 5 percent. Initiative 97 is drawing perhaps the most heat-and-light of all the ballot proposals because it directly pits environmental organizations and community organizations against the oil-and-gas industry in the latest battle of a years-long war over energy production, specifically the proximity of the production to residential areas, schools and environmentally sensitive lands. Northwest Douglas County Economic Development Corp.
A report issued in July by the Colorado Oil and Gas Conservation Commission stated that the initiative would prevent 85 percent of non-Federal land in the state from being explored for oil-and gas production. More than half of the land in the state would be off-limits to new energy development. COGCC is charged by the legislature with balancing oil-and-gas production with protecting the environment, wildlife and public safety-and-health. In addition, a new report by the REMI Partnership found that Initiative 97 would cost the state 100,000 jobs by 2030 and harm the state’s economy. The Partnership includes the Common Sense Policy Roundtable, Colorado Concern, Colorado Bankers Association, Denver South Economic Development Partnership, and Colorado Association of REALTORS. If approved by voters, the measure requires that new oil and natural gas development not on federal land be located at least 2,500 feet from an occupied structure or vulnerable area. A state or local government may require a setback greater than 2,500 feet. If two or more local governments with overlapping jurisdictions establish different setback requirements, the larger setback is applied. Oil and gas development is defined as the exploration for, and the drilling, production, and processing of gas and liquid hydrocarbons. This includes gas flowlines, and the treatment of waste associated with oil and gas development. Renewed production of an oil or gas well that had previously been plugged or abandoned is considered new development. Occupied structures means any building intended for human occupancy, including homes, hospitals, and schools. Vulnerable areas include playgrounds, permanent sports fields, amphitheaters, public parks, public open space, public and community drinking water sources, irrigation canals, reservoirs, lakes, rivers, perennial or intermittent streams, and creeks. The state or a local government may designate additional vulnerable areas, which must then be considered for any setback site calculation. 1,000 feet from high-occupancy buildings such as schools, health care institutions, correctional facilities, and child care centers, as well as neighborhoods with at least 22 buildings. Currently, the 500-foot setback prohibits oil and gas development on about 18 acres surrounding a given point, and the 1,000-foot setback prohibits development on about 72 acres. This measure increases the setback to a minimum of 2,500 feet, or about 450 surrounding acres. State and local revenue from oil and natural gas. Companies that extract mineral resources, including oil and natural gas, coal, and metallic minerals, pay severance taxes to the state. Oil and natural gas producers also pay income taxes, sales taxes, use taxes, and local property taxes. The abstract includes estimates of the fiscal impact of the initiative. If this initiative is to be placed on the ballot, Legislative Council Staff will prepare new estimates as part of a fiscal impact statement, which includes an abstract of that information. All fiscal impact statements are available at www.ColoradoBlueBook.com and the abstract will be included in the ballot information booklet that is prepared for the initiative. State and Local Government Revenue and Expenditures. The measure is highly likely to decrease the amount of severance tax, royalty payments, and lease revenue that state and local government collects in the future, and the amount of state and local expenditures of that revenue. Economic Impacts. This measure constrains well location throughout the state except on federal lands and is likely to reduce future oil and gas development in the state. The current 500 foot setback prohibits oil and gas development on about 18 acres surrounding a given point. The measure increases the setback to a minimum of 2,500 feet or about 450 surrounding acres. To the extent that the measure reduces development, there will be less oil and gas employment, less demand for associated services, reduced rent and royalty income to mineral owners, and reduced profits for operators. Increasing the setback distance may preserve property values for homeowners most affected by the setback and, to the extent less development improves health outcomes for affected residents, may increase productivity and reduce medical costs. One generally reflects the viewpoint of Republicans and the other the viewpoint of Democrats, a difference largely manifested in the recently completed legislative session with the passage of SB-1, the marginally bipartisan bill that represented the legislature’s best shot at tackling the problem. Initiative 153 would increase the state sales tax for 20 years by 0.62 percent to 3.52 percent, and the revenue would be used to repay up to $6 billion in bonds to be used state roads, local transportation needs and multi-model transportation projects. 40 percent for municipal and county transportation projects. The measure also creates a citizen oversight commission that must annually report how the bond proceeds have been used. Initiative 167 has been put forth by Jon Caldara, the colorful-and-quotable head of the conservative think tank, The Independence Institute, which would require that the legislature pay from current revenue the debt service on $3.5 billion in transportation bond sales. Called “Fix Our Damn Roads,” Initiative 167 would require the legislature to first make debt-service payments before allocating General Fund revenue to such other programs as P-12 and higher education, corrections and social services, including Medicaid, which the Democratic-controlled legislature expanded in January 2014 under the Federal Affordable Care Act. In brief, State spending on other governmental services over twenty years would be reduced by $5.2 billion through fiscal year 2038-2039 because the money would be directed to paying off the bonds. Democrats are concerned that, during the next recession, the legislature would be forced to make deep cuts in education, corrections and social-service programs because the $350 million would first have to be paid each year to service the bond debt. A state that defaults on bond payments faces the drastic prospect that its credit rating could be drastically downgraded, which would raise borrowing costs. The measure requires the executive director of the Colorado Department of Transportation (CDOT) to issue Transportation Revenue Anticipation Notes (TRANs) no later than July 1, 2019, in a maximum amount of $3.5 billion with a maximum repayment cost of $5.2 billion over 20 years. Voter-approved proceeds from TRANs are TABOR-exempt and must be used exclusively for road and bridge expansion, construction, maintenance, and repair on the 66 projects identified in the measure, which include projects in each of the state’s 15 transportation planning regions. Transit projects are excluded from the list. The measure requires the principal and interest on the borrowed money to be paid without raising taxes or fees. The state must reserve the right to repay the TRANs ahead of schedule without penalty. For more information on the ballot issues, contact Loren Furman, CACI Senior Vice President, State and Federal Relations, at 303.866.9642. “Education tax hike will be on Colorado’s November ballot, Secretary of State says,” by Ed Sealover, The Denver Business Journal, August 9th. “Initiative to pay for preschool, full-day kindergarten qualifies for Colorado ballot,” by Ann Staver, The Denver Post, August 9th. “School-tax amendment makes Colorado’s November ballot,” by Marianne Goodland, Colorado Politics, August 9th. “Two ways to fund highway fixes among seven initiatives that could be heading to voters,” by Ed Sealover, The Denver Business Journal, August 7th. “Colorado’s deadline to turn in ballot measure petitions is today. Here’s what questions you might get to decide in November,” by Corey Hutchins, The Colorado Independent, August 6th. “Anti-fracking ballot campaign turns in 170,000 petition signatures, eyes Colorado ballot,” by Greg Avery, The Denver Business Journal, August 6th. “Effort to make Colorado governments pay for hurting property values turns in petitions in bid for ballot,” by Greg Avery, The Denver Business Journal, August 6th. “Colorado ballots could be cluttered with initiatives that cause problems for businesses,” by Ed Sealover, The Denver Business Journal, August 2nd. “Education Tax Increase Proposal Takes Dead Aim at Higher-Income Taxpayers, Corporations and Non-Corporate Businesses,” Colorado Capitol Report, July 27th. “Ballot Wars: Competing Transportation Funding Measures May Be on November Ballot,” Colorado Capitol Report, June 1st.